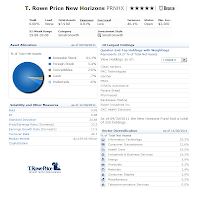 The following fund, T. Rowe Price New Horizons, is one of the top US stock funds and oldest funds offered by TRP. This small growth US stock fund is investing in US small cap companies. Details review can be found below. The primary investment objective of this T. Rowe Price New Horizons fund is to seek long-term capital growth. This TRP fund invests mainly in a diversified group of small, emerging growth companies, preferably early in the corporate life cycle before a company becomes widely recognized by the investment community. It may also invest in companies with accelerating earnings growth because of new products, new management, or structural changes in the economy. This equity fund may also invest in foreign companies. From the fund details above, you will notice this fund has total nets assets of $7.91 Billion. This fund also doesn’t have any yield (i.e. yield is 0%). As part of no load fund, this stock fund only has an expense ratio of 0.81%. This fee is lower than category average expense ratio of 1.48%. As of March 2010, the fund’s manager is Henry Ellenbogen. Ellenbogen joined TRP on April 2001. He is the portfolio manager and a vice president of T. Rowe Price Group Inc.
To buy this best small growth US stock fund, you can be purchased from 88 brokerages such as Edward Jones, Schwab Retail, Scottrade Load, TRUSTlynx, Ameriprise Brokerage, etc. As this is the only class of this fund, investor can start investing with $2,500 initial investment for regular brokerage account and $1,000 for tax deferred account (IRA account, ROTH IRA, 503b, etc). Morningstar has rated this fund with 5 stars rating. For forward investment, Morningstar has rated this fund with Bronze Rating. This top rated stock fund has returned 15.32% over the past year, 30.03% over the past 3 year and 8.43% over the past 10 year. The ratio of up compared to down years in term of return performance is 18:7. This PRNHX fund has its best 1-year total return in 2003 with 49.31% total return. For 2011, the fund’s total return is 6.63%. According to the fund prospectus, this top stock fund’s analysts look for small growth companies with the following characteristics: effective management, operate in high growth area, effective research, effective marketing, effective product development & service, use sound financial & accounting policies, etc. The investment risks include active management risk, market risk, investment style risk, market capitalization risk, foreign investment risk, etc. As of October 2011, the fund asset allocations are: 91.1% in domestic stock, 5.4% in foreign stock, 2.6% in convertibles, 0.7% in cash, and 0.6% in preferred stocks. As of December 2011, the top 6 sectors of PRNHX fund are Information Technology (25.3%), Consumer Discretionary (21.6%), Health Care (19.5%), Industrials & Business Services (16.3%), Energy (5.9%), and Financials (5.2%). The top 10 stocks holdings of this TRP fund are Clean Harbors, FMC Technologies, Gartner , MSCI, O'Reilly Automotive, Panera Bread, Pharmasset, Rackspace Hosting, Roper Industries Inc, and SXC Health Solutions.